The “RC drone” sub-group is currently putting together a group buy for the parts to build at least 3 Kossel Delta Printers. One of the group members has already built one from a kit (which was somewhat beta), and most of the bugs have been worked out. 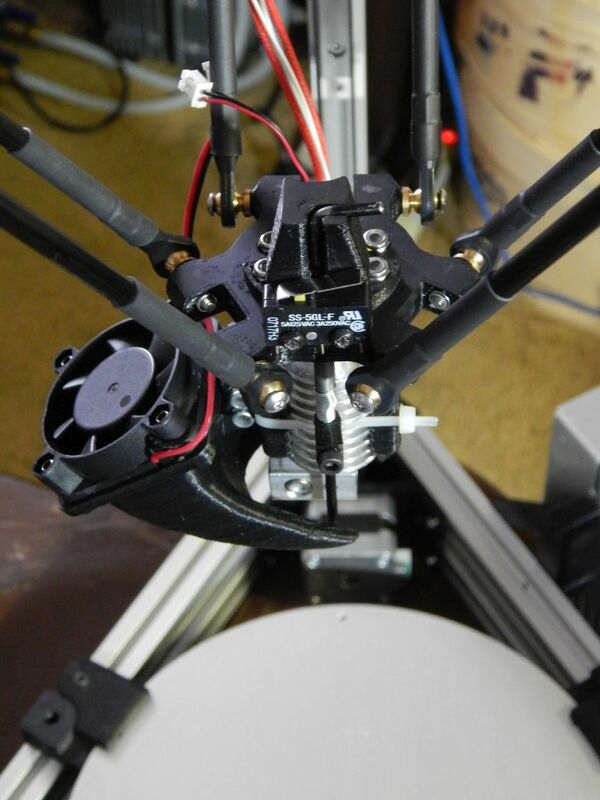 The Kossel printer that we are building in this group buy is this style. The idea of sourcing the parts ourselves is to reduce the price and also to allow some flexibility in the choice of components beyond what is included in the kit from FolgerTech. One of the alternate component choices would be substituting a controller that utilizes a 32-bit ARM processor for higher performance. The kinematics of delta printers are computationally intensive, and a standard 8-bit Mega 2560 Arduino board is really working hard to keep up. There would be other options you could choose, such as an LCD display and SD card reader. We would need the $300 up-front before we placed the orders so we don’t get stuck with a bunch of extra parts. This price might have to be adjusted slightly in the end if you choose to omit parts, or to add optional components. You will be responsible for printing the plastic parts, or finding someone that will make them for you. 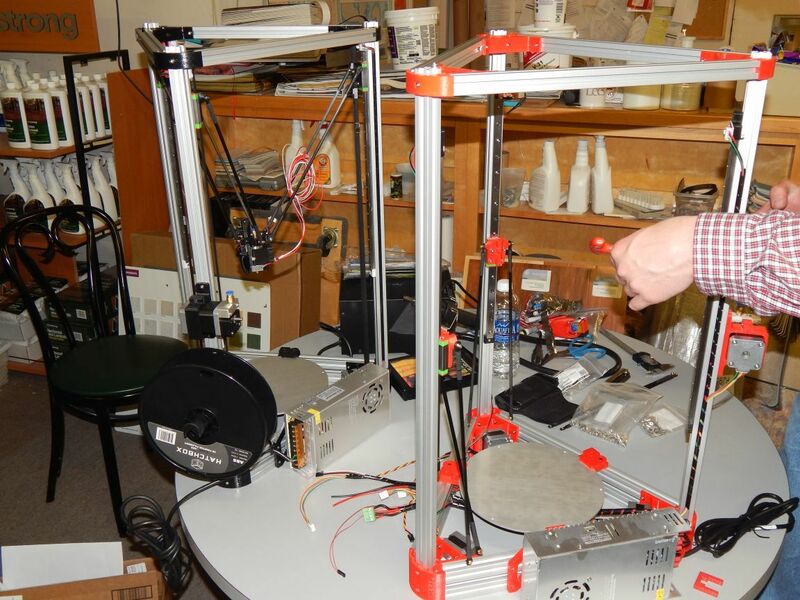 This is an opportunity for members to build a high quality 3D printer that is fast, accurate, and just plain fun to watch. 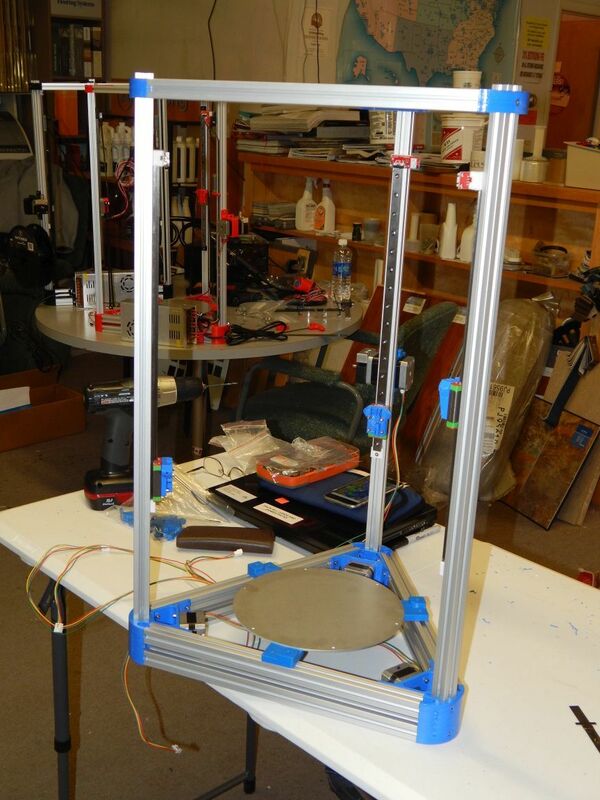 They are a bit more complicated to setup than a conventional Cartesian printer, but we will help you if you get stuck. Please understand that we aren’t going to build the machine for you, you MUST be willing to roll up your sleeves and devote some serious time to both assembling the hardware, and configuring the firmware. Ultimately, you MUST understand how the machine works in order to be able to maintain it. One other option we discussed was the idea of building one for The MakeSpace. We are willing to donate our time and some parts to build the machine, but the group would have to support a major part of the expense. I’m interested, but not 100% ready to pull the trigger. I’m grateful for the group for pursuing and offering this! I’ve been researching to build my own - I was looking toward a Prusa i3 design, but I’m open to a delta. The Folgertech link says 210mm build area - is that the size you’re spec’ing out, and what is the build height? As for the printed parts, a quick search finds me some kits of printed parts that I can buy for ~$35-45, if I chose to go that route. Would this parts kit fit a ‘standard’ plastic parts kit I could buy? A Prusa i3 design could certainly be built for less. You can buy a full kit from FolgerTech for $320 that basically includes everything. We decided to go the Delta route because it offers some real advantages over a standard Cartesian design. Mainly, less moving mass and therefore less inertia. It is also inherently a bit more rigid. These factors make it better able to print faster with higher accuracy. It is a bit more complicated to setup, therefore maybe not quite as beginner friendly. 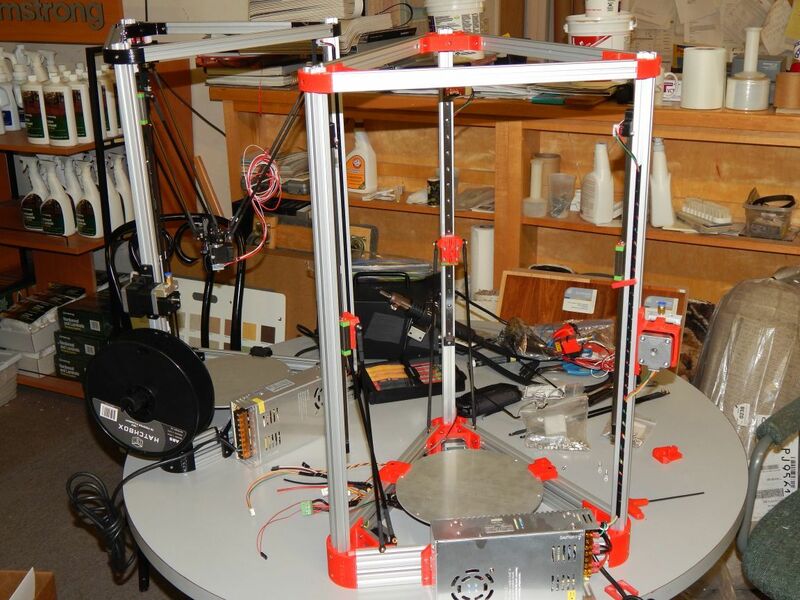 But it can be successfully built as a first printer. One of us (John) has already proven that. 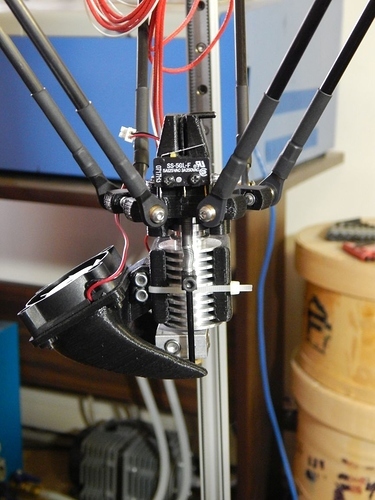 The build area of a Kossel can be changed by changing the length of the linkage rods. I think the diameter of the build area on the Folgertech kit is determined by the bedplate size. We are planning to buy 220mm plates. The build height is about the same - maybe a little more. You could use a standard printed parts kit such as sold on eBay, etc. Or, you could get someone in the Space to print them for you. I’d be willing to print them out on my DaVinci in ABS for maybe one or two people if you cover my materials costs. (or, even better, buy me a roll of 1.75mm ABS filament) I think ABS would be preferable to PLA for parts like the effector plate which is going to be near the hotend. The other thing that is going to be valuable in this group buy/build is that we can help each other and exchange ideas to make the machine better even after the initial build is complete. Anyone wanting to get a flavor for the construction process can view the assembly manual, configuration manual, pictures, and more on the FolgerTech Google drive located here. We plan to place our parts orders within the next few days. We are anxious to get our parts so we can start building! I went ahead and bought this one. Should be here in the next week or so. Joseph, That is exactly the machine we are building, with many parts that are quite likely sourced from the same supplier that Folgertech uses. We went this route to allow customization/substitution as well as cost reduction. 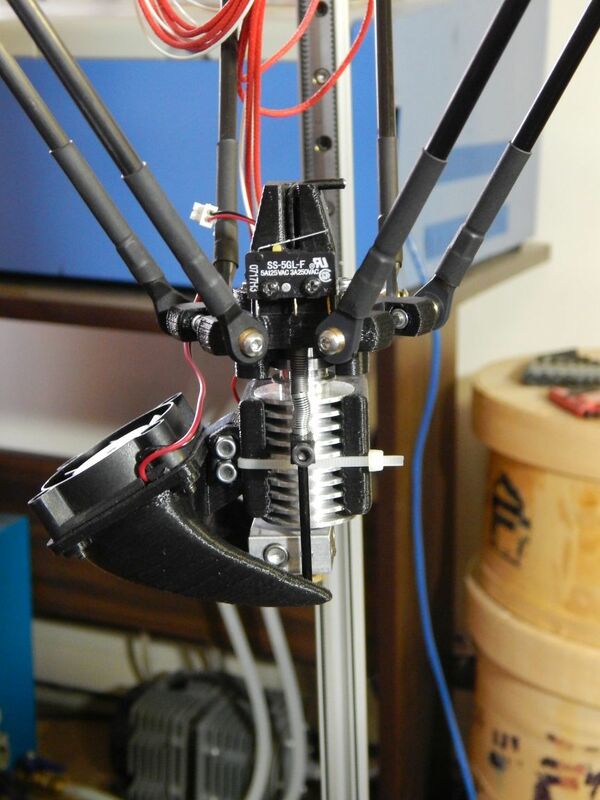 If you read the Folger Tech Kossel Delta 2020 thread on the Raprap forums, you’ll get a feel for the TRUE delivery times, and the outstanding issues that kit builders are still battling. 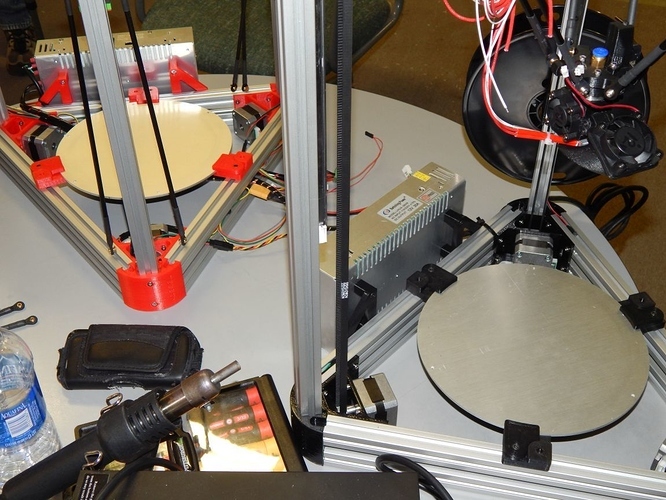 John, Kevin, and I have gotten a feel for how to work around most of the issues with the Folgertech Kossel kit that John bought back at the beginning of the year. We are taking what was learned on John’s Folgertech kit and applying those lessons to the three new machines we are building. When you do get your kit, you are certainly welcome to join us if you encounter problems or have questions. The Folgertech documentation is slowly improving, but it’s not there yet. Kit builders are still serving as beta-testers. We are proceeding with ordering parts now. I hope to periodically post updates and photos to let other MakeSpacers share in the process. I would be interested in upgrading the printer once I have established the initial build. So tips and ideas posted here would be nice. Greg - is it possible to still get in on this? I’ve now got a check in hand, and I’ll take you up on the offer to print the parts if it still stands! PM me with details, I can be available to meet this week after work or during the day if needed. I just placed the order with RobotDigg in China last night. Sorry about that. We ended up breaking our budget anyway, because we elected to go with Fedex shipping which is VERY expensive for a large international package. We decided we didn’t want to wait a month for the order to arrive. If you are interested, I can put our spreadsheet with all of the parts and sources on Google docs. We are buying most of our parts from three Chinese sources. State-side we bought the extrusions and fasteners from two different vendors. In the end I think we payed more for Fedex shipping split 3 ways than what we would have payed if we’d have just ordered the parts ourselves and opted for slower shipping. If you want to order the parts yourself, you could certainly still do that. We might get a head start on you, but you can join us later if you have any questions or need any help. I am still willing to print the parts as mentioned above. Argh… I snoozed, I loozed. No worries. I was going to ask to see your parts list, I was starting to price for myself off of FolgerTech’s parts list. I’d appreciate if you could post your list, and if you haven’t made all your orders yet, if I can add to your future buys. From the little I’ve read about buying direct from overseas, I wonder if your high FedEx shipping cost includes Customs fees? I’ve been curious how Customs works, I’ve only ever ordered direct overseas from DealExtreme (your vendor Banggood looks like a clone of DX) for small stuff and they’ve never had Customs fees added. Pretty much all of the parts have been ordered. Yes, the linear slides are expensive. Some people are building their machines with roller wheel carriages. They probably won’t be as smooth, but they are a heck of a lot cheaper. Google - Kossel 2020 roller carriage. I’ve bought from both DX and Banggood. I prefer Banggood these days. To many problems with backorders on DX. You can expedite shipping from Banggood for $1.99 on many items. Never had to pay customs for anything shipped via any gov’t postal service. However, FedEx and UPS are different I think. Depending on the value of the items you order, you may get a bill in the mail to pay a duty fee. It’s been years since I’ve run into that, so I think it’s rare. Here is a link to the Google docs spreadsheet. EDIT: Link to Google docs spreadsheet updated. Previous sheet had incorrect part number for the 623ZZ ball bearing - it should have been a flanged bearing - part number F623ZZ. I’m looking forward to seeing photos! And if you came across any snags that I should avoid, I’d like to hear. Thanks for the update on the bearing type. I had some of my parts ordered (the order from robotdigg which included the wrong bearings), then some things came up and my purchasing was on hold for a while. I’ll be buying more parts soon. -What lengths did you get your 2020 extrusions cut for? I found a calculator at https://docs.google.com/spreadsheet/ccc?key=0AihVdu60WUfgdGZUOW1BVVdzc2pjdzRSd0ZUMXgtM1E#gid=0 which I used to maximize build area on the 220mm diam. heated plate - I come up with 306mm for the horizontals, and i chose 600mm for verticals - my choices give 185mm build height. Did you use similar lengths or something significantly different? -Where did you get your hardware (nuts/bolts/etc) from? I see preassembled hardware kits from aliexpress, did you go this route? I’m still debating on Arduino vs. 32bit ARM controller. Thinking that the ARM is the way to go, but I may skip on the LCD display. Is there much benefit to printing standalone from SD card, vs keeping a PC connected via USB and sending the print via USB? -Any other bits of wisdom that would benefit me? The bearings really aren’t critical. I ordered flange bearings form a second source and they shipped the standard ones instead. I just about pulled my hair out at the point. 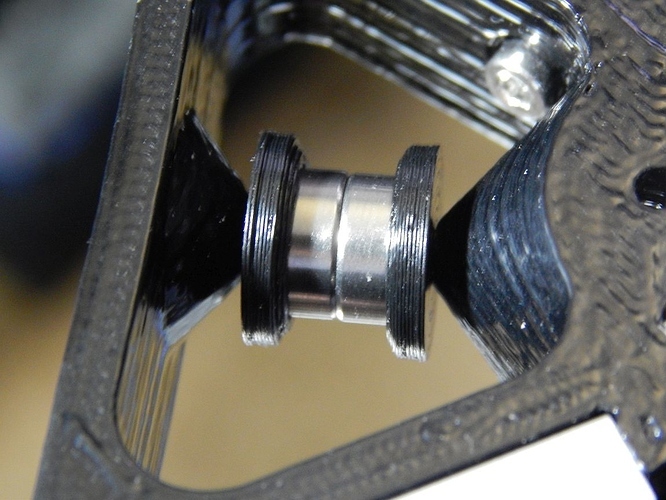 I ended up modelling some tapered spacers to allow the two standard bearings to be used. They have a shoulder touching the inner race to allow the bearings to spin freely. I’ve been meaning to upload those and a bunch of other parts that I modeled to thingiverse, but have been swamped at work and extremely pre-occupied at home. We went with larger horizontal extrusions - 350mm. (700mm vertical). Our rod lengths (center to center) ended up being about 325.3mm. That is using an effector plate that I modeled with a 24mm radius to the rod connection axis. That gives us a potential built diameter of 236mm assuming a minimum rod angle of 23 degrees. We ordered the 220mm aluminum heated bed plates from eBay (on the spreadsheet), but I have seen 240 and larger around also. I also ended up ordering a 220mm borosilicate glass bed plate from AliExpress because I have glass on my other printer and I thought I might like it better. If you go with glass, you’ll need to buy the PCB heater separately. John Smoyer ordered all the hardware from Boltdepot.com, with the exception of the T-nuts which we got from Robotdigg. (you have to make sure to specify 3mm T-nuts after you order from RobotDigg - the default is 5mm) I did end up getting a few odds and ends from Fastenal out towards to mall. They have a pretty good selection of small metric fasteners. We were using the OpenSCAD visual Kossel calculator. It’s not hard to use - just download and Install OpenSCAD first, then get the files for the Kossel mini calculator in the second link and throw them all in one folder. John and Kevin went with with a standard RAMPS 1.4 plugged into a Arduino Mega 2560 clone. Tried and true solution - and very inexpensive. I took a chance and went with a very new integrated 32-bit board called an AZSMZ mini. Mainly because I wanted to run 32 microstep drivers and was concerned that the ATMega might speed limit me. There are a number of tricky steps in assembling the printer, but nothing you can’t handle. If and when you need printed parts, let me know. I can start trickling them to you as I get time. I think at some point (soon), we’ll be bringing the machines into The Space to demonstrate them. That would be an excellent opportunity to inspect them - which might answer a lot of questions on the spot. Thanks for the detailed responses, and the photos - they look good so far! Those pictures were taken about almost 2 weeks ago. John has his printing, but he’s still working on the Z-probe. Kevin is pretty far along also. I’ve run into some USB stability problems as expected. I have a micro USB cable with ferrite core coming to see if that will help. I have mine partially calibrated, I can home it and jog it around. I’m also waiting on some brand new software that will provide an inexpensive WiFi control and file transfer solution using a $3.00 ESP8266 WiFi module. Once I get that, I may not even need to use USB for anything.